Another south-of-the-border inspired dish. What is there about the bright, tangy, sour-citrusy taste of roasted tomatillos that gets me every time? I love how those flavors complement the smokey zing of chilies, so much so that I decided to replace the traditional sweet red tomatoes in this Pueblan dish with a handful of fresh green tomatillos. Mmmmm, good decision. It took tinga into a new level of flavor. It was still comfort food with shredded meat and potatoes in a spicy sauce, but oh! what a sauce. 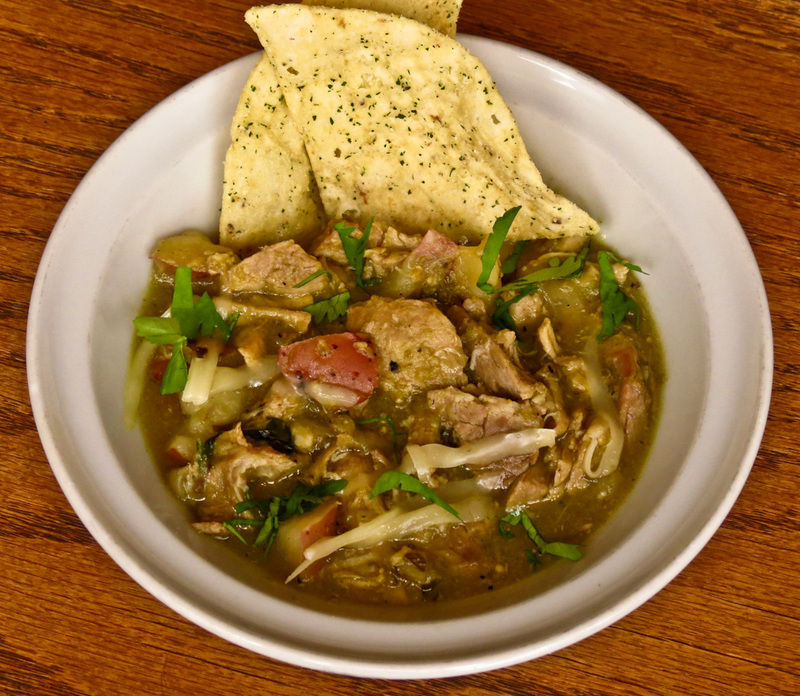 A Rick Bayless recipe was my starting point, as is often the case with Mexican dishes. (My three Bayless cookbooks are splattered and stained from years of use, always a good sign for a cookbook.) I think this tinga variation is a winner; homey, if not quite authentic, Pueblan cooking. A winner? Oh, yes! its a new favorite chili-like recipe that's terrific served in a bowl - or in a tortilla - or in so many other presentations. See below for several other tasty ideas and give tinga a try. I think you'll like it. 1. Place the pork in the bottom of a good-sized heavy pot or Dutch oven, at least 4-quart with a 10 to 12 inch diameter. Scatter the potatoes on top of the meat. 2. Roast the chilies and tomatillos until charred. Seed and peel the chilies (or not, if you’re after more heat). 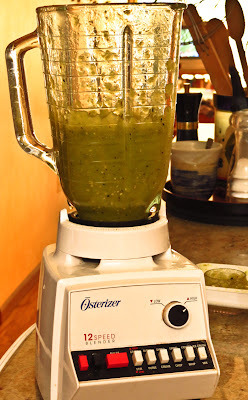 Toss the chilies and tomatillos into a blender (be sure to capture all of the juices as well as the flesh) and puree with a few pulses. 3. Add the remaining 7 ingredients, onion through 1 cup chicken stock and pulse a time or two just to mix, not to puree the onions. 4. Pour the mix evenly over the pork and potatoes, cover and cook in a 300 F oven for 2 to 2½ hours until the pork is completely tender. Add more chicken stock if the sauce becomes too thick (unlikely). 5. 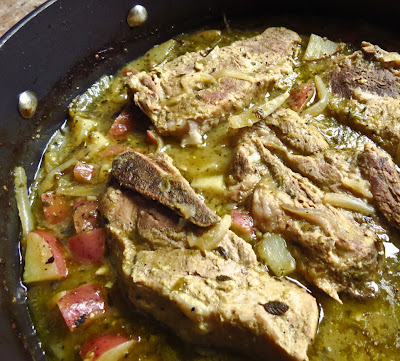 Remove the pork steaks or chunks from the pot; use two forks or your fingers to break into smaller pieces or shreds. 7. 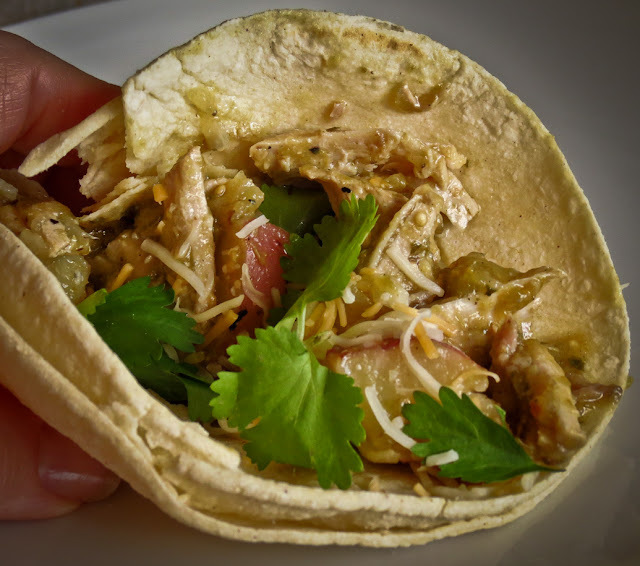 Serve with the warm tortillas, crumbled cheese and avocados for making soft tacos. Or serve in a bowl with toppings to enjoy like chili. Or use the mix to top a crispy tostada, stuff a burrito or enchilada, fill a torta or quesadilla or an omelet, or even top a baked potato or rice. Some tinga recipes call for chorizo to be crumbled and fried, then added to the sauce at the end of cooking, just before serving. Other recipes use the rendered chorizo oils to sauté the onions at the beginning of the recipe. Either option sounds delicious. For a more carnitas-like treat, after step 5 fry the meat in a bit of oil until the edges crisp, then mix with the sauce and serve. Use a slow-cooker to make this a fix-it-and-forget-it recipe: slow-cook on high for 6+ hours, and you can hold on the “keep warm” function for another 4 or more hours. This would be a useful game day feature when schedules are unpredictable. oh you are right! it IS tinga week. :) or day, haha. this sounds awesome. can't go wrong with rick bayless! I also have Mexican Everyday and love it! Haven't made this recipe, but will be making it now. Lovely dish! I completely agree - roasted tomatillos are unlike anything else I've tried. I so wish I could find them where I live, but I've never had any luck. I'm so glad you mention Mexican Everyday - I've heard lots of recommendations, but don't have it yet! It sounds like we all love Mexican Everyday! I have yet to find a Bayless recipe I didn't enjoy; the same goes for his PBS cooking shows.